New Online Slot Games come out so often from the online casinos that it is very difficult to keep up with every single brand new slot that gets launched, however we have tried to list at least one or 2 new online slots from the various casino software providers such as Microgaming, RTG, Playtech and Rival Gaming. 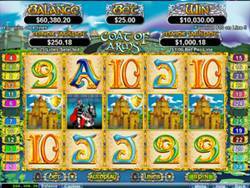 We have also listed some of the most popular slots as voted by our players. 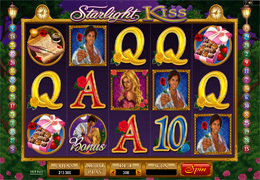 Starlight Kiss is a 5 reel Video Slot from Microgaming. There are some great rewards for players such as the 243 Ways to Win, Wild and Scatter icons plus Bonus rounds. The Romance Bonus with up to 10x Multipliers will be triggered when the two lovers show up together on the reels. Players will then have the choice to pick 3 out of 10 icons on the screen to help increase the Bonus Multiplier amount. The Scatter icon that show up either on reels 3, 4 or 5 will reward Free Spins together with a Multiplier of 2x to the player. 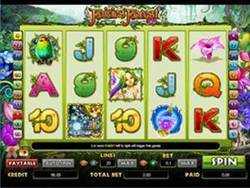 Easter Surprise is a new Playtech slot game with 5 reels and 20 paylines. 3 or more Easter Eggs on an active payline will start the Easter Egg Bonus. During the bonus round you get to choose from a basket of Easter eggs to win big cash prizes or if you hit the free games feature you get the triple multiplier too! 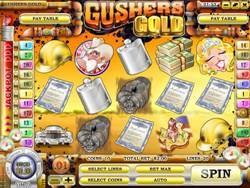 Gushers Gold is a new 5 reel Rival Gaming slot which is set at an oil rig. You will win coins when the oil reaches the top of the rig and activates the red light. The Gushers Gold bonus round will be triggered when you hit 3 or more drill bit symbols. Select your oil-rig, and choose your drill depth to search for oil and win coins. 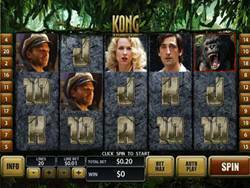 Kong is a 5 reel, 20 payline slot from Playtech containing 2 bonus rounds. When 3 or more Kong symbols appear, you will be transported to the 1st bonus round, which is the Jungle Island Bonus round, where you will choose 3 creatures to win a cash prize. You will then go through to the 2nd bonus round, which is the Big City bonus round, where Kong has to knock down planes.